Left and Write: Y is for : You Bet Your Life!! Y is for : You Bet Your Life!! No, this one isn't about any sort of fatal, Hunger Games type game show. This was an olllllld game show, back when they called them "quiz" shows, hosted by "The one....the only....Groucho! ", as in legendary comedy genius, Julius Henry (Groucho) Marx. The show began, with host Groucho and his assistant/announcer/straight man George Fenneman, as a radio program on the ABC network in 1947, transitioning to t.v. 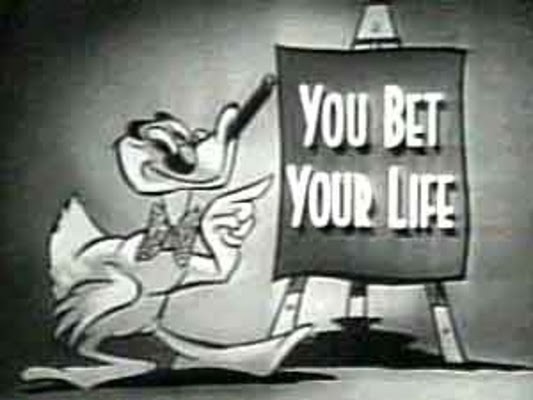 in 1950 on NBC. The format was pretty simple. Groucho would host two strangers who were teamed and had to work together in order to answer questions correctly. As long as they answered correctly, they went on and collected money. A wrong answer, though, would send them packing. There was, also, a chance to win $100.00 if one of the contestants mentioned the "secret word" (or woid as Groucho would say) during their conversation with Groucho. 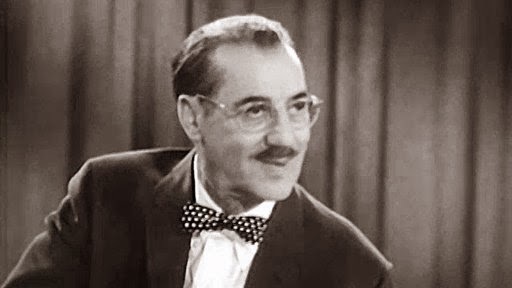 Always chosen and revealed before the contestants came out, if one of them said it, a stuffed duck with a Groucho mustache and glasses would drop down on a string, carrying a $100.00 bill in its.....bill. It's seriously doubtful that anyone watched the show for the actual game. Most watched it for Groucho's ad lib conversation with the contestants as well as his zingers directed at announcer George Fenneman. To this day, I've yet to see anyone in comedy.....scratch that, anyone at all....with a quicker wit than Groucho Marx. Of course, Groucho didn't have to worry such inane things as "political correctness" and just let the quips fly. I first caught You Bet Your Life in the mid 70s when it was in syndication and always, always, got a laugh out of it. In fact, it was one of my first exposures to Groucho Marx and, later by their movies, The Marx Brothers. In the annals of game show history, I'd say you still be pretty hard pressed to find a show that was better timed, executed, and gave as many laughs as You Bet Your Life. Never saw this and bet my husband would love it, being the avid Groucho fan that he is... Can't wait til tomorrow to see which fox you'll highlight! Never knew Groucho did a game show, I'd like to see that. Never saw that show or any of the others. I'm not a big game show person though I watch Jeopardy on occasion. There's a great Animaniacs parody of that show. This is one I've never seen, but I've seen all the honorable mentions! My mom and I used to watch this show back in the day. Groucho was a hoot. I loved that show and I don't like to use that banal phrase but "love it, I really did,"omg Groucho ..... and that walk of his..... but how true that if he said the spontaneous things today that he said back in the 60's (or whenever it was) every 3-letter organization would have him banned from TV. Living in this "new speak" world, one certainly doesn't get the laughs like they used to. My brother did a decent Groucho impression. I adored the Young Indiana Jones series. Very cool. When I was a kid I used to watch this and even though a lot of the humor went over my head I still thought is was funny. Groucho was brilliant.